I have to admit, I was super excited about all the awesome feedback I got from my 13 Bloggers to Read in 2013 series. Let's face it, we all love stumbling across new blogs to stalk. But seeing someone's button plastered on a sidebar doesn't tell you much about the person behind the writing. On the other hand, there's something about reading a heartfelt and honest review from one of your favorite bloggers that makes you want to see what all the fuss is about! Which is why, the jury is still out on sponsorship. While it's a great way to gain exposure, it just doesn't feel...real. I want every facet of my site to represent me. My posts are real, my photos are real and my endorsement of my fellow bloggers is real. That's why I'm kicking off a new initiative on this blog! Each month, I'll select one of my favorite blogs to share with you all. The candidates will all be blogs written by ladies (or guys!) who keep it real. Blogs that keep me coming back, week after week. Blogs that deserve to see their follower count increase. And I'm inviting you to do the same! Link up with me each month, and share your absolute favorites. Spread the word, and the love and give your followers someone new to check out! So who, you may wonder, is my pick for February? I first fell in love with Kelle's writing when I stumbled upon her daughter's birth story on Pinterest. She wrote so poignantly about seeing her daughter for the first time and the moment she realized her baby girl had Down Syndrome. I was immediately brought to tears. Recently, she wrote a post about savoring the last few weeks of her third, and what will likely be her last, pregnancy. Once again, I wept. Are you sensing a theme here? In terms of writing, no one in the blogging world is comparable to Kelle. She published a memoir entitled Bloom, last year, which admittedly I have not yet read (but I do intend to!) which causes me to hope that there are many more books in her future. If you're looking for encouragement, for inspiration, or just some refreshingly beautiful writing, Kelle is your go-to girl. 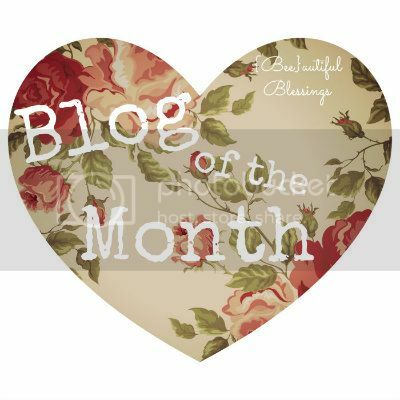 Who is your Blog of the Month? Grab a button and link-up so I can discover even more wonderful blogs to read!